Upbeat acoustic with a twist of world music - stories and songs that speak to the heart! 13. Who Was Actually Invited? 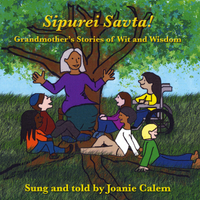 “Sipurei Savta: Grandmother’s Stories of Wit and Wisdom” is a collection of (mostly) old Jewish folk tales. Some are from the Torah, some are old legends, some have been passed down through song, and some are new twists of traditional tales. I have long treasured these stories and their many messages: of the importance of working together in community, of thriftiness and recycling, of resilience in the face of challenge, of keeping perspective even in tough times, of the wisdom of the natural world, and of humility and openness to difference. Of course, there are also stories of just plain old silliness…wit and wisdom forever combined, with messages and fun for story lovers of all ages. Joanie is joined vocally on this CD by the Little Minyan Makhela from Columbus, OH. Many thanks to Tom Boyer of GBS Studios for recording, accompanying, singing, and helping to create wonderful musical tapestries (and for the chocolate!). Thank you to Arkadiy Gips for sharing his amazing violin playing on this CD. Thank you to Sandy Jones for the wonderful fiddling. And thank you to Jane Van Voorhiss for her beautiful cello addition. All of the arrangements for the stories and songs were written by Joanie Calem, © 1998 – 2017, except for the music of: Something From Nothing and Hop Meine Homentaschen.